Saturday 4th June – 10.00 a.m. – 2.00 p.m. Practical work party. Removing Himalayan balsam at Broxtowe Country Park. Meet at the Nottingham Road entrance near Cinderhill Island, convenient for Phoenix Park tram stop. Saturday 11th June – 11.00 a.m. – 2.00 p.m. Peregrine Watch. 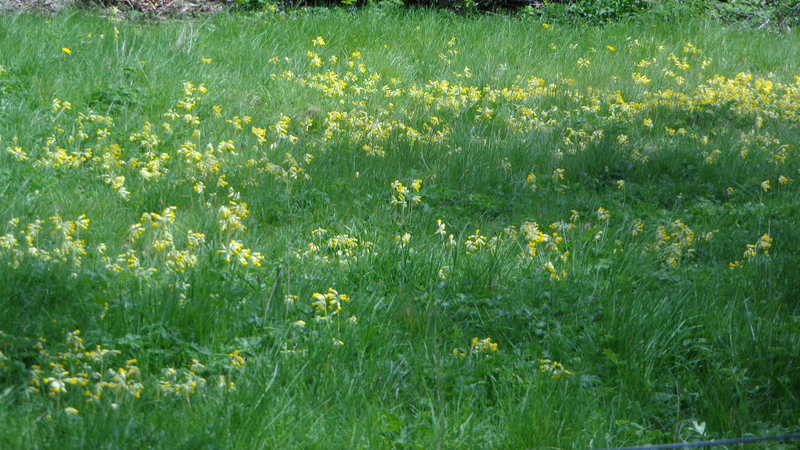 Grassed area in front of Nottingham Trent University on South Sherwood Street. 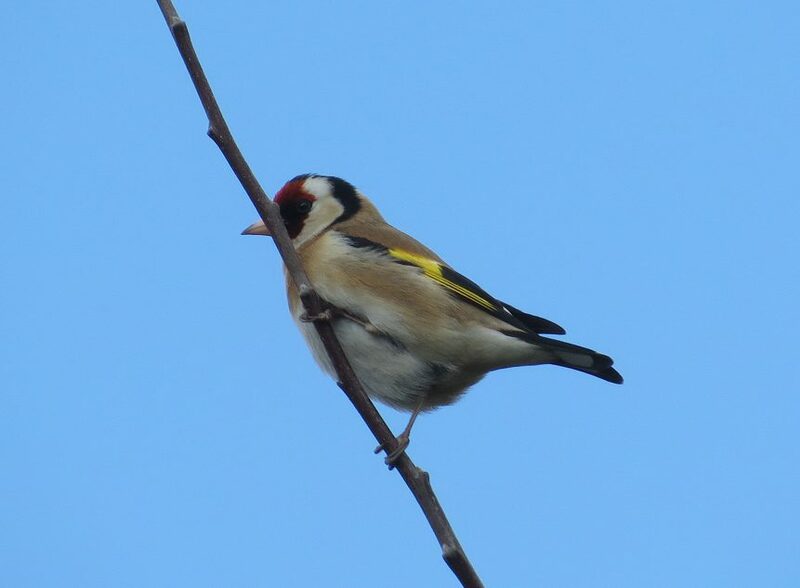 Goldfinches are lovely little birds, often seen in small flocks. They are specialist feeders on seeds of plants such as thistles, dandelions and teasels – all plentiful on St.Anns Allotments, where Nic took these photos. The photo was taken at Raleigh Pond, believed to be an old clay pit fed by an underground spring. The pond lies in Harrison’s Plantation, a Wildlife Trust nature reserve in Wollaton. 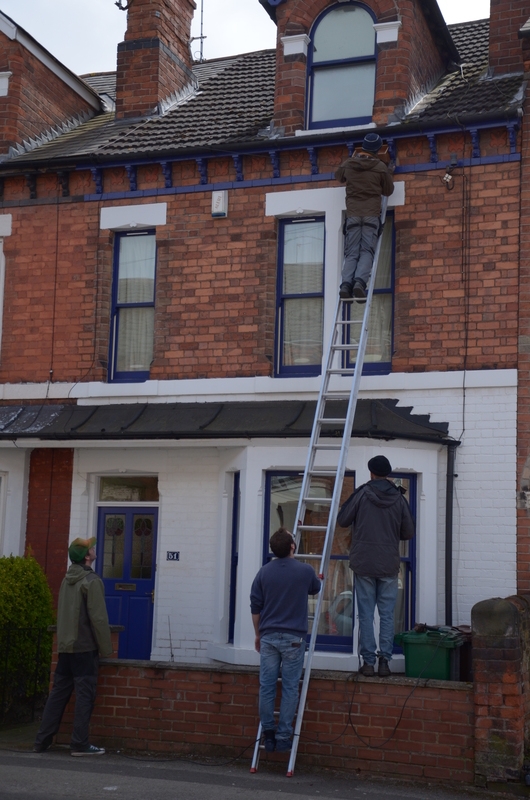 Last week I helped put some Swift nesting boxes on houses in Church Drive, Carrington…. We put a number of specially-designed nesting boxes (like this) under the eaves of several houses on the north-facing side of Church Drive…. The boxes will hopefully encourage the birds to nest. Swifts (Apus apus) are remarkable birds; supreme fliers which spend most of their lives in the air. They migrate here from central and southern Africa to breed, arriving in late April-early May. They have declined in number in recent decades, and a loss of suitable nesting sites is an important factor in this decline. Nest boxes fixed under house eaves can help reverse this. 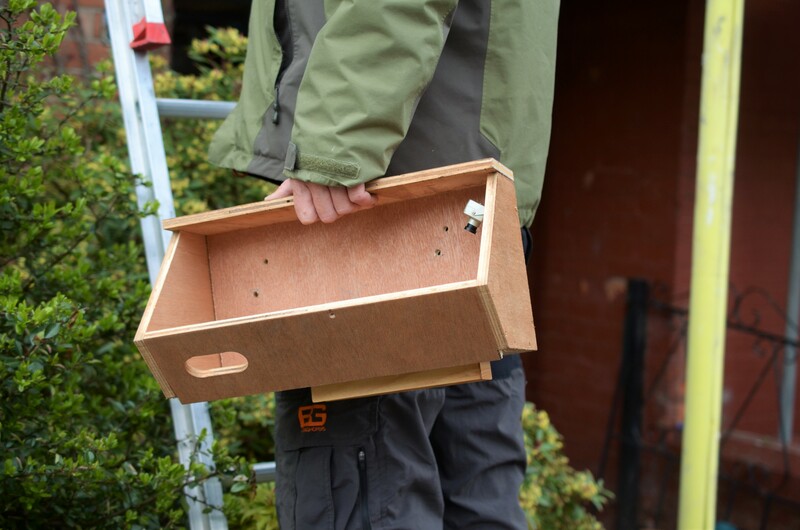 The next boxes in Church Street were fundraised and fixed as part of a local community project called Swift Street, which aims to inspire local people about nature while helping the Swifts. 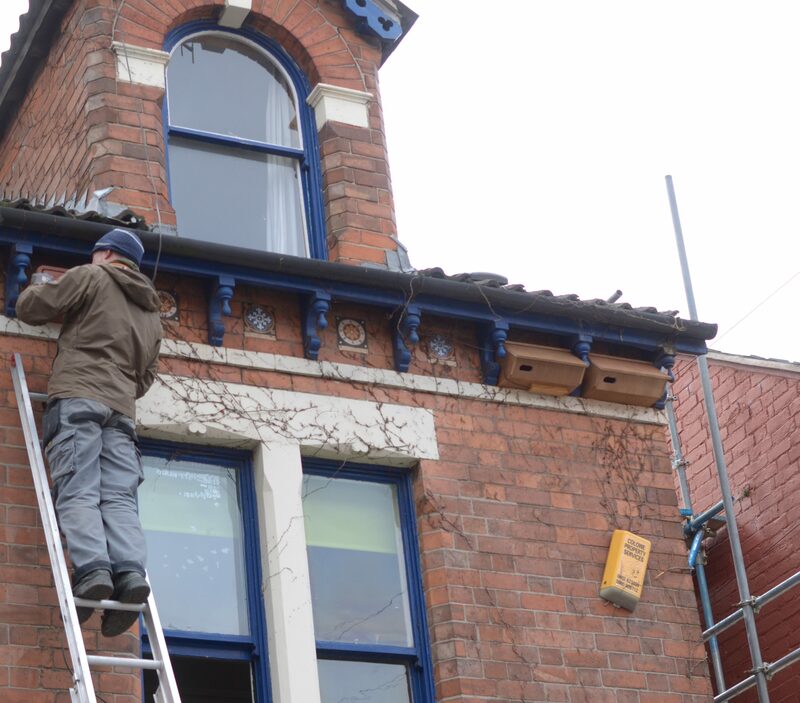 It’s a great example of a small-scale wildlife project in the city, and particularly valuable because it brings nature right into the daily lives of people where they live – people in Church Street are talking about Swifts and looking at the skies now! One of the nest boxes was fitted with a webcam, which will allow people to watch these fascinating birds in close detail if the box becomes occupied….. There is also a plan to play recordings of Swift calls from windows near the boxes, to encourage the birds to investigate the new nest boxes. Let’s hope the boxes prove successful. Thanks to Trish from Instar for the photos. 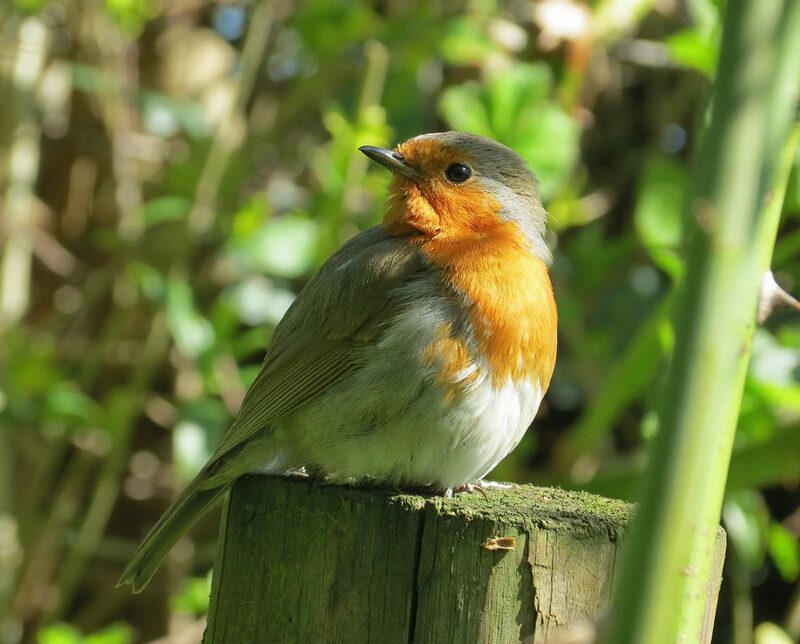 Another good bird pic from Nic Cairns…a Robin (Erithacus rubecula) photographed at St.Anns Allotments…. Thanks to Nic for his continued contributions. Nic Cairns keeps the excellent photos coming….here’s one of a Jay (Garrulus glandarius), not the easiest bird to spot and photograph…. Jays are the most colourful of the British corvid species, and are thought to play an important role in the distribution of oaks – they feed on acorns, and may collect and hoard thousands in the autumn, some of which will be forgotten and germinate. 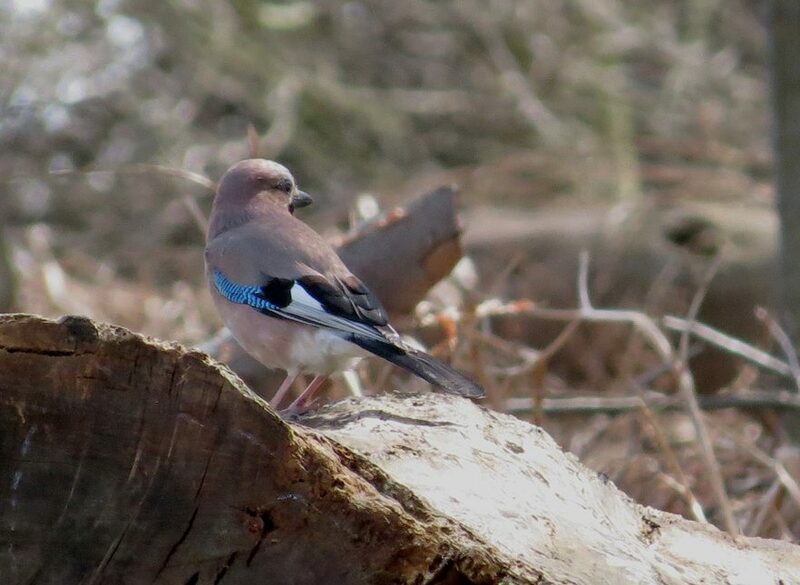 Wollaton Park, where this Jay was photographed, is ideal habitat for these attractive birds. 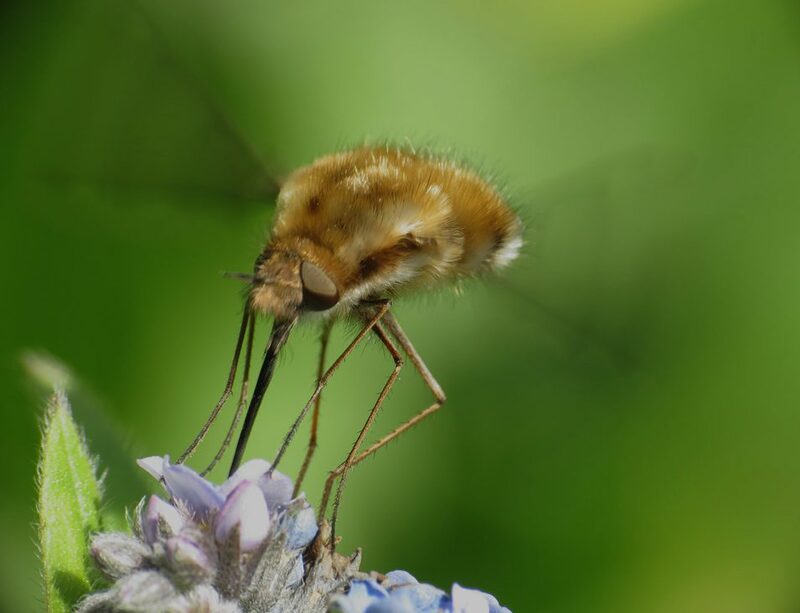 I’ve featured Bee-flies before, and here’s another excellent close-up, from St.Anns Allotments…. It’s hard to identify the different species in flight, but this is almost certainly Bombylius major, by far the most common species, and one of only two likely to be seen in April. Bee-flies are interesting insects, which mimic bees, and lay their eggs in the nests of solitary bees; their larvae then parasitise the growing bee larvae, gradually sucking out its internal fluids. As illustrated in the photo, adult Bee-flies feed on nectar with their long proboscis. Thanks to Nic Cairns for the photo. 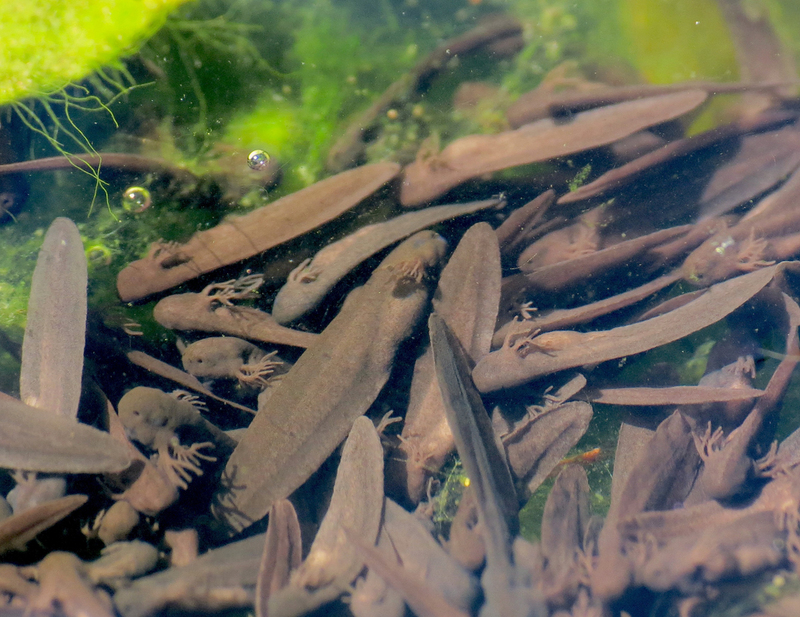 These are tadpoles of the Common Frog (Rana temporaria), photographed massing in a warm part of a pond at Ecoworks Community Garden. The tadpoles are still at an early developmental stage, as their external gills can clearly be seen in the photo. These disappear soon as the tadpole develops a mouth. 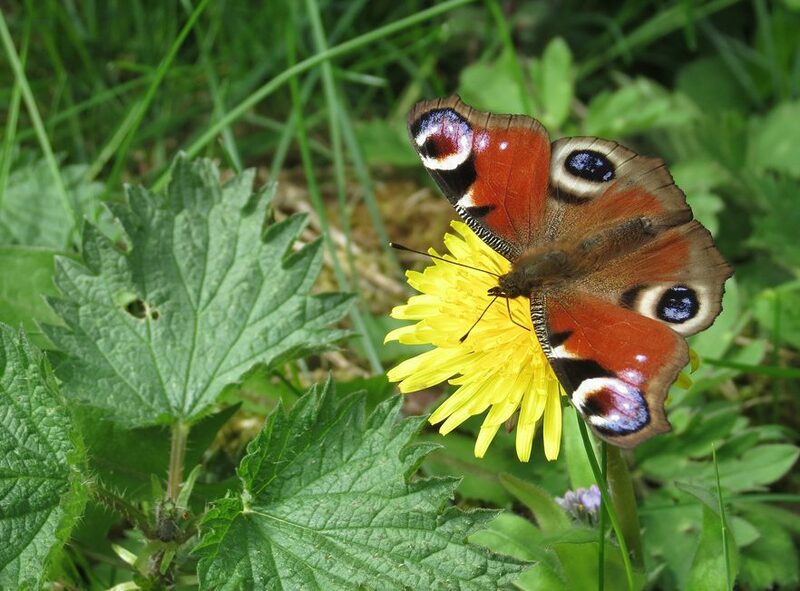 The recent warm spring weather has brought the butterflies out….. 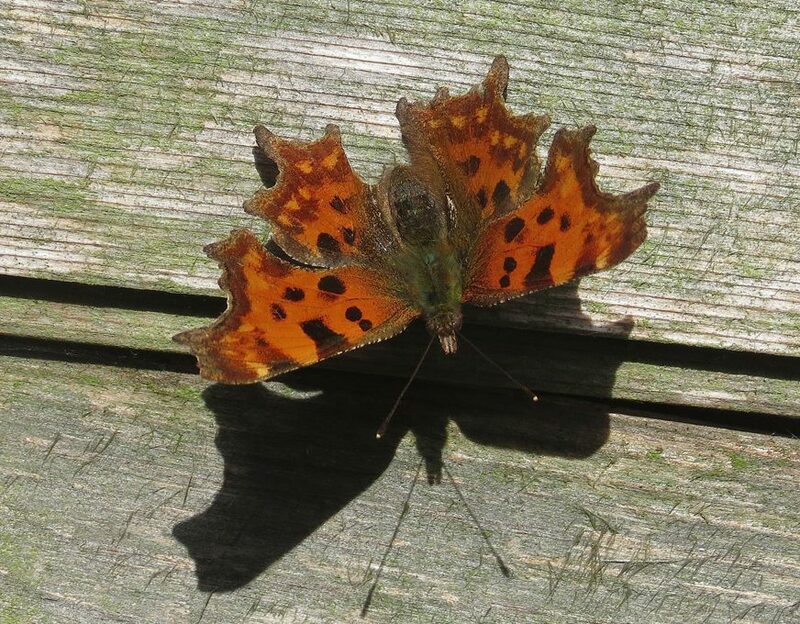 Both the Peacock (Aglais io) and the Comma (Polygonia c-album) are amongst the relatively few British butterfly species that hibernate, and these will have been overwintering individuals recently emerging in the warm weather. 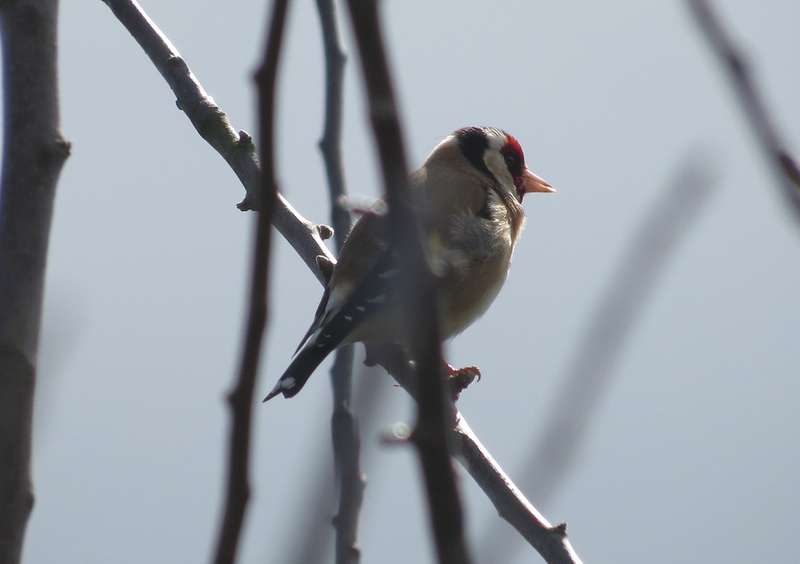 Thanks to Nic Cairns for the photos, taken at the St.Anns Allotments. Another photo from the RBRGHA allotments in Wollaton…. 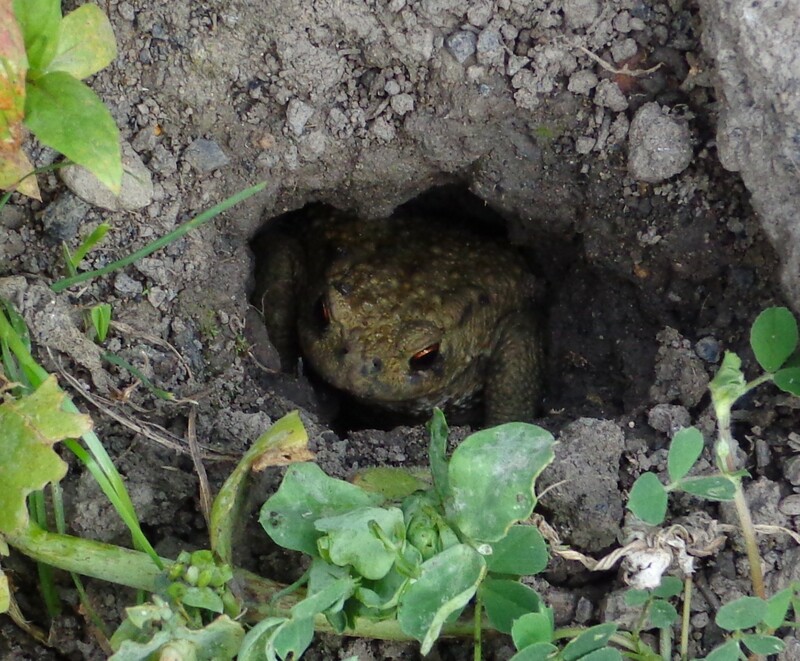 It’s a Common Toad (Bufo bufo), sheltering in a hole. Thanks to Viv Crump for the picture. Sadly the clearance of this wildlife-rich allotment site has started, so who knows what will become of this shy amphibian….its future is probably not so rosy.